Mix above ingredients. Dip by tablespoon full in hot oil. Press with back of spoon to make patties. Brown on both sides and drain on paper towels. Best served warm. They go great with fresh sliced tomatoes. One of my favorite things about having a friend is that sometimes they know you better than you know yourself. 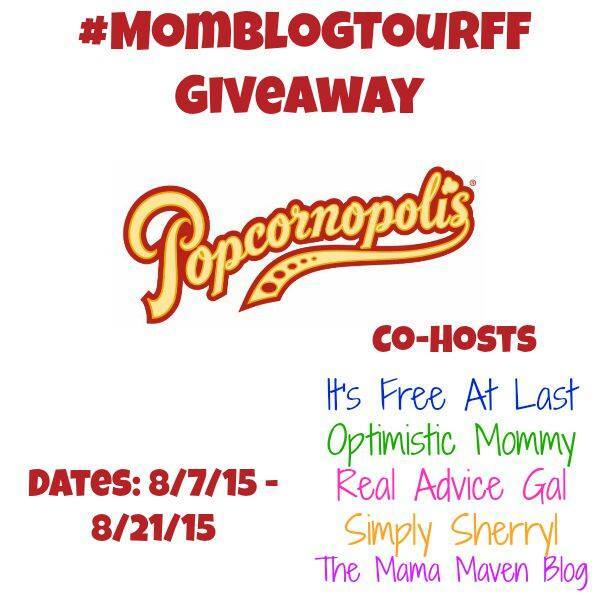 Looking for more blog friends head over to friendship Friday where you will find me as well. 1888 The first practical adding & listing machine (calculator) was patented by William Burroughs. Spumoni is a molded Italian ice cream made with layers of different colors and flavors. The treat usually contains candied fruits and nuts. Often found with 3 flavors with a fruit and nut layer between them. Typical flavors include cherry, pistachio, and either chocolate or vanilla. The fruit and nut layer often contain cherry bits. Popular in the U.S. where National Spumoni day is august 21st. Line 9- by 5-inch loaf pan with plastic wrap. Place a 12- by 8-inch piece of parchment paper into pan, letting sides overhang the edges. Spread pistachio ice cream into pan and smooth the top. Freeze until semi-frozen, about 20 minutes. Stir vanilla ice cream, chopped cherries, almonds, brandy, and almond extract until combined. Stir in food coloring (if using) to desired shade of pink. Spread over pistachio ice cream. Freeze for 30 minutes, or until semi-firm. Spread chocolate ice cream over cherry ice cream and smooth top. Wrap and freeze until completely solid, 3 to 4 hours. Remove from pan, remove wrap, and slice with a hot, wet, knife. 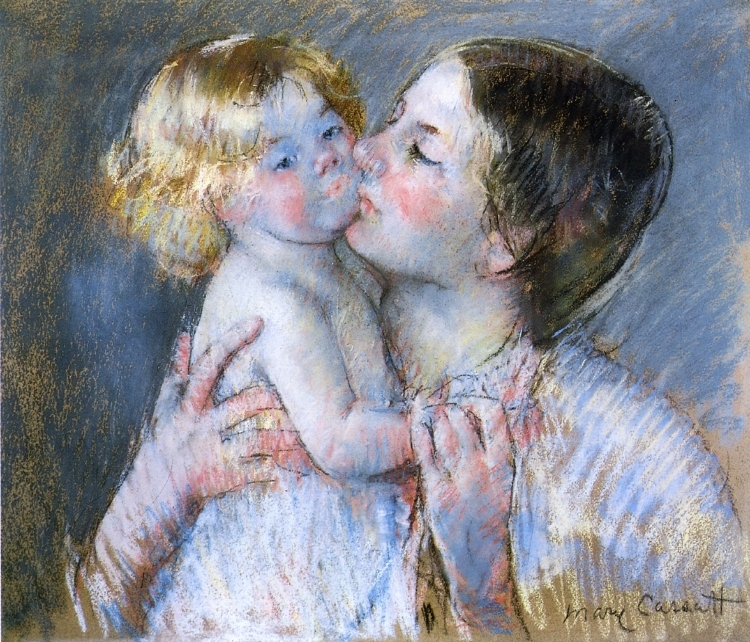 Mary Stevenson Cassatt was born in 1844 and lived a right old age for that time period passing in 1926. She was an artist who had a way of sharing a glimpse into the private life of women and families. She created images of the social and private lives of women. She often emphasized the intimate bond between mothers and children. Cassatt was born to an upper-middle class family from Pennsylvania. Born into a family well educated and with a rich background her family believed that travel was very much part of education. She would live for 5 years in Europe and see the sites. Cassatt also spoke German and French. It was while in Europe that she developed the love of drawing and music. Upon returning to her home the family objected to her becoming a professional artist but she went on to attend the Pennsylvania Academy of Fine Arts at the age of 15. She lived the years of the American Civil War going to school and after school continued to study alone and earned no degree. She then moved back to Paris with her mother and attended art school there. School is back in session here and all ready we have started sending more than our share of items to school. I am sure that this will continue as our little princess does well in school and in return we make sure she has all she needs. I am sure that most of you are like that reward the good that our children do. The only thing is that I also like her to keep what is hers and that means I try to label everything that she gets. There are many different styles available and some of the cutest are available at Stuck On You. http://www.stuckonyou.com/ and use the code get30. 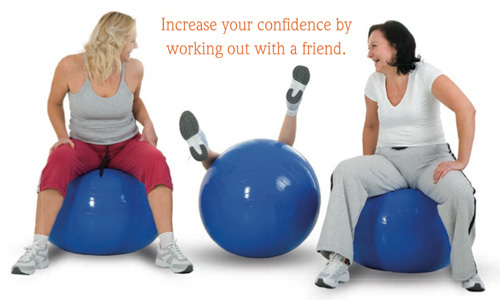 Canceling a work out will be less likely if your workout partner is your good friend. Not wanting to let the other down will promote you to want to keep your workout dates. Melt together and whisk until thickens and is smooth. Add to the vegetables and stir, let simmer on low heat. In a large skillet- melt butter on medium-high. Trim crusts off bread slices & throw them to the birds, you won’t need them. Cut bread into 1/2-inch cubes place in skillet. Cook until golden brown. Transfer to paper towel & pat dry. Get your cooled, boiled potatoes & trim off peel. Cut into large cubes. Refrigerate for 30 minutes. 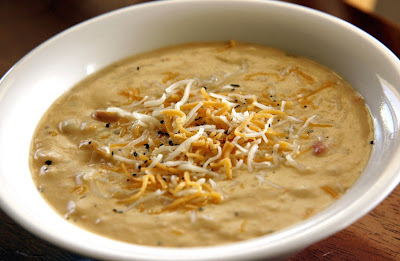 In a large bowl- mash potatoes with fork or masher. Mix in salt & nutmeg. Add 1/2 cup flour & cornstarch. Using your hands, knead mixture in bowl until smooth. You may need to add a dash more flour if dough in sticky. Form dough into balls, using about 1/2 cup mixture for each. Insert buttery bread cube into the center of each dumpling. 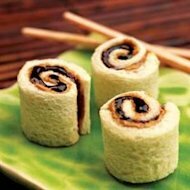 Roll dumpling between palms to enclose bread cube completely and form smooth balls. It’s kinda like preschool Play-Do fun, right? In a large pot- add half full of salted water & get to simmer. Once simmering, add 4-5 dumplings into pot & cook until the dumplings rise to the surface, about 10-15 minutes. Transfer to bowl & keep covered with a damp, clean kitchen towel as you cook the rest. Lynda Lanker, an artist from Kansas City , Missouri was born in 1943 Growing up in Wichita Kansas, a cowboy town for sure, she attended the Wichita State University and majored in painting and earned a bachelor's degree in art education. Lynda was inspired to become an artist as a child and began her career as a middle school art teacher. Lynda was married to a Pulitzer prize winning photographer Brian lanker. In Lynda's early 30s her and husband moved to Oregon and she concentrated more on her art. She earned a reputation as a portrait painter during the 70s and 90s. I especially like the "Tough by Nature" series of women ranchers and cowgirls in American west. Another great lunchbox idea. Check it out, so yummy, easy and I know our little ones like them as well. Cut pound cake into squares and slide onto a skewer with your favorite fruit. It's simple, it's easy and everyone loves it. Combine milk, cornstarch, sugar and egg yolk into a medium sauce pan. Whisk together well. Over medium heat, cook until it thickens and comes to a simmer. Whisk constantly. It will take about 10 minutes. Then remove from heat and add in vanilla, butter and white chocolate. Mix until everything is melted (make sure white chocolate melts completely. Pour into a bowl and cover with plastic wrap and chill for four hours or overnight. In a small cup or bowl combine the gelatin with the water. Let it stand for about 10 minutes. Then pop into the microwave for about 10 seconds to melt the gelatin. Cool to room temperature. Then combine cream, powdered sugar and vanilla. Whip until thick. Add in gelatin and mix until medium peaks are formed. Fold the whipped cream into the white chocolate mixture in 3 parts. Cover and chill for at least an hour or overnight. 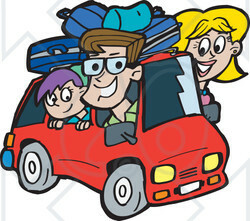 Plan your trip, plan the route you will take and try to decide where you will need to stop. 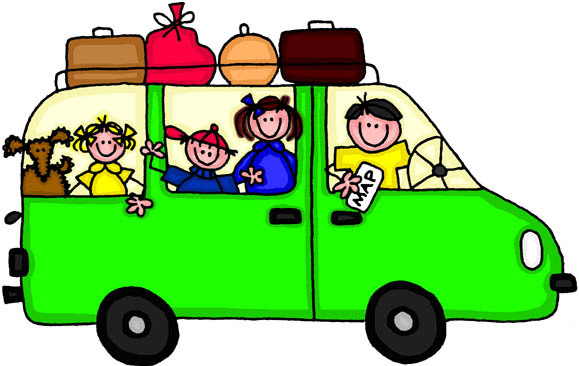 We travel with young children who can travel quite a bit but may need more breaks than older children or adults. Take a look at what restaurants, diners, or stops are on your way there. Remember we will all have stories to take back home with us why not make it some cool stops along the way?? 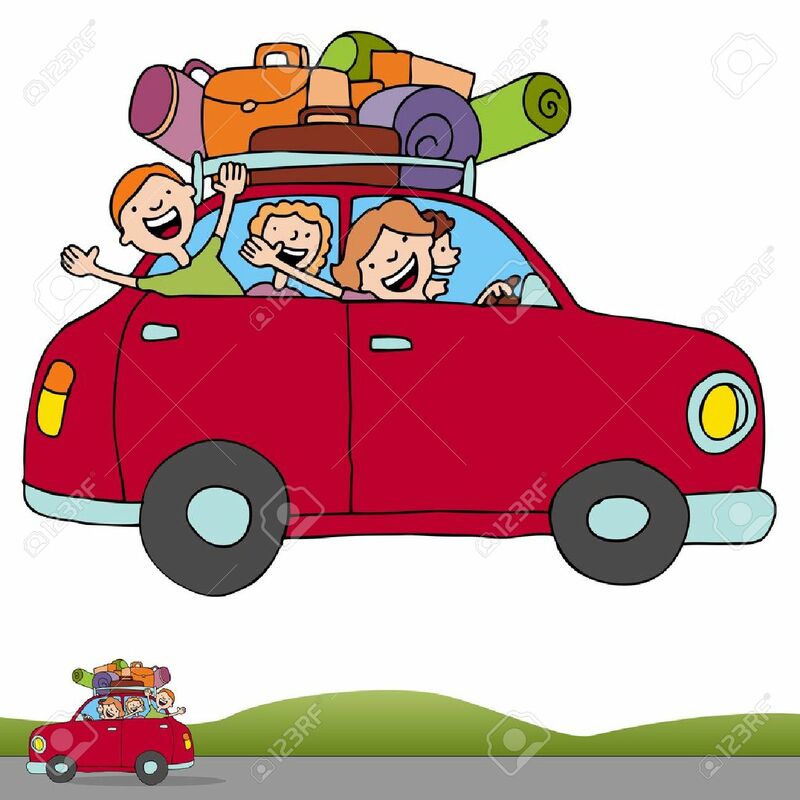 Keep some activities in the car for the passengers both old and younger ones. Books, colors, stickers, small toys, hand held games even a pillow will make for happier passengers. Entertainment in the form of music or if you are lucky enough dvd's. These will help keep the little ones entertained during the ride which makes it easier for all to have a great time. * saute until beef if browned and onions tender, drain if necessary, set aside. 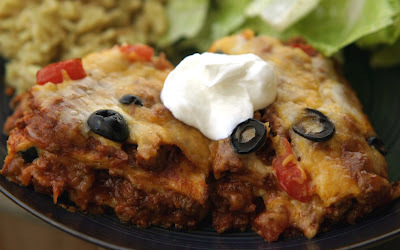 In a round dish similar to a pie die but deeper or a rectangle glass Pyrex pan layer tortillas, meat sauce, cheese, olives tomatoes, repeat 3 times total. Bake covered at 350 for approx 30-40 minutes. 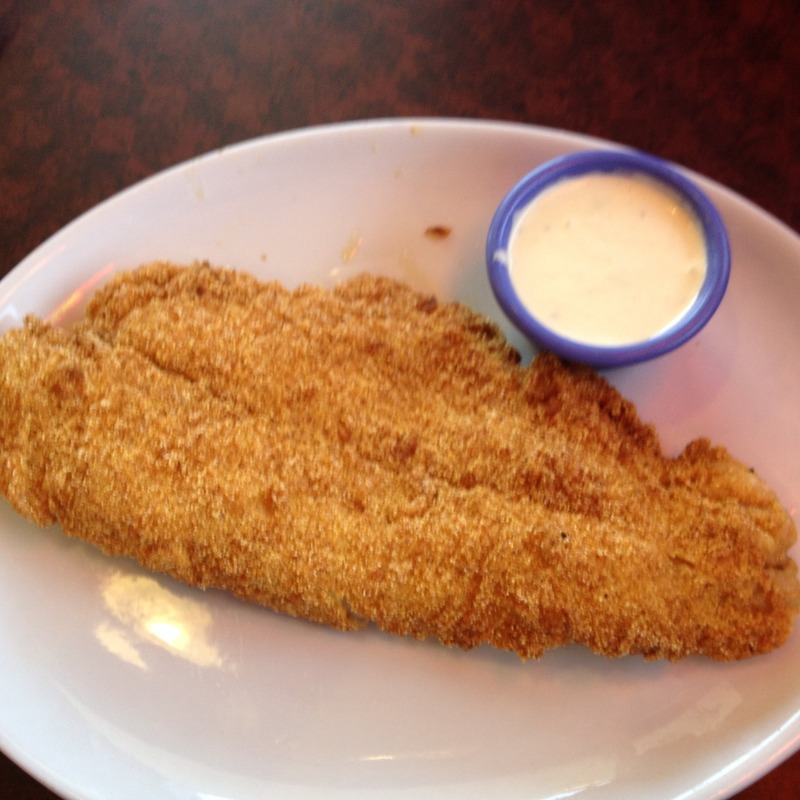 Serve with sour cream, shredded lettuce, rice and chips. Life this hard may be a little hard with work, back to school and so many other things going on it may just be time for a delicious treat. Check out this frozen mud pie, might be perfect to unwind this weekend. In a large bowl, dissolve the coffee granules in the coffee liqueur. Add the ice cream, half of the whipped topping, and 1/2 cup pecans Mix Well. Pour into a pie crust, cover, and freeze for at least 4 hours. Top with the remaining whipped topping and sprinkle with the remaining 2 tablespoons pecans. Drizzle with the melted chocolate, and freeze for 4 more hours, or until firm. Serve, or cover and keep frozen until ready to serve. 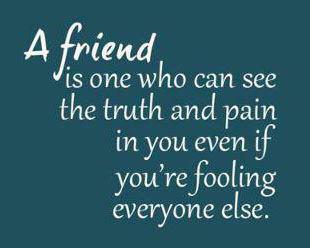 If you have friends and they see how well you get along with you friends then they will be able to model this behavior. It is important that you show a give and take relationship and build on this at home. Princess is learning the hard way that while she may win some games at home she is not always the winner. This helps her learn the skills of give and take. She also learns that when someone is sad or not feeling well that we try to help them out. I think living in a large family helps us out there. Help your child work through childhood friendship problems and drama. Yes, I did say drama you may be surprised as to what may come up. It is important to help your child understand the situation and things from both sides. In the beginning I was guilty of choosing my child's friends or trying to (by the way this did not work) It is important that your child find their own friends. I nearly always tried to point princess towards children who went to our church, we knew their parents or way or another fit into our circle. The truth is she liked most of everyone and made friends that crossed through so many barriers and she really loved it. She did not worry about who was popular and neither should we, allowing her to enjoy her friends was the best. Have a chat with your child before school starts about bullies. We have all ready seen our share and it is very important to not let it continue but to speak up and let someone know. 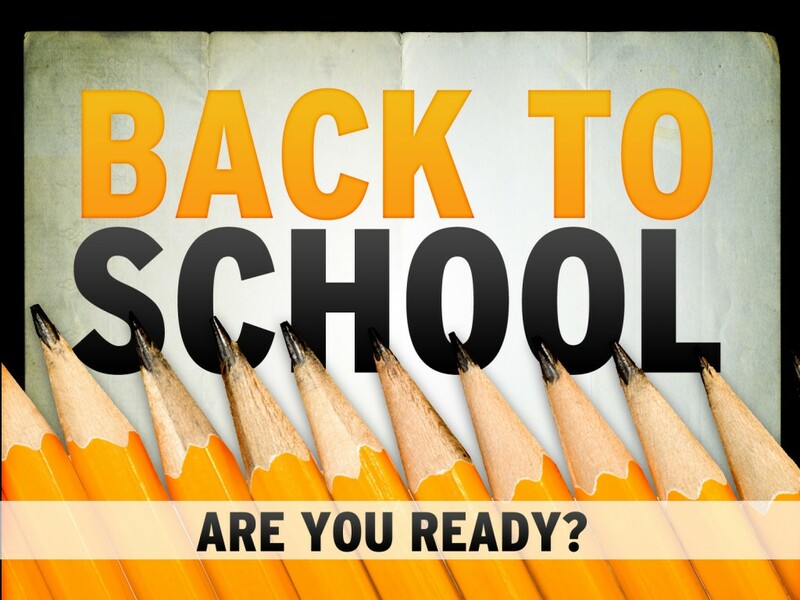 Its back to school week are you ready??? Well ready or not the time has come. 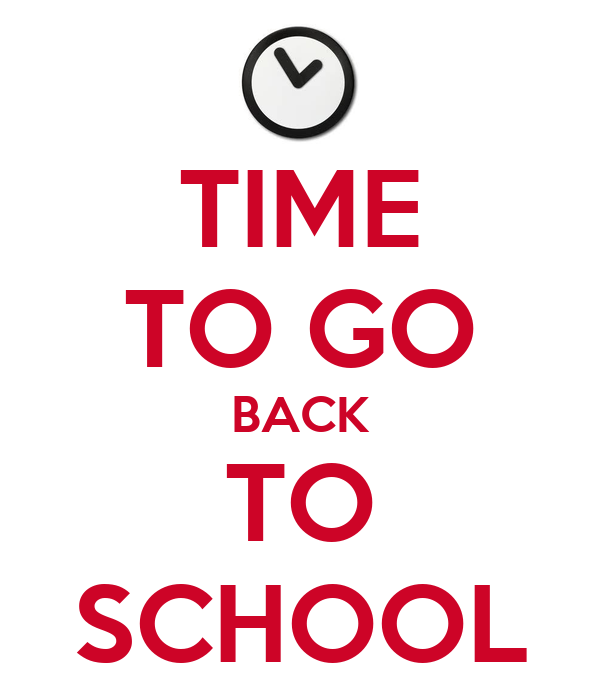 Now what can you do to help make it the best ever back to school?? Time to change your summer schedule into a back to school schedule. Waking up early, eating meals at a time that fits into the schedule. Head to the parent orientation meeting. We did this last night we met the teacher and checked out the room. 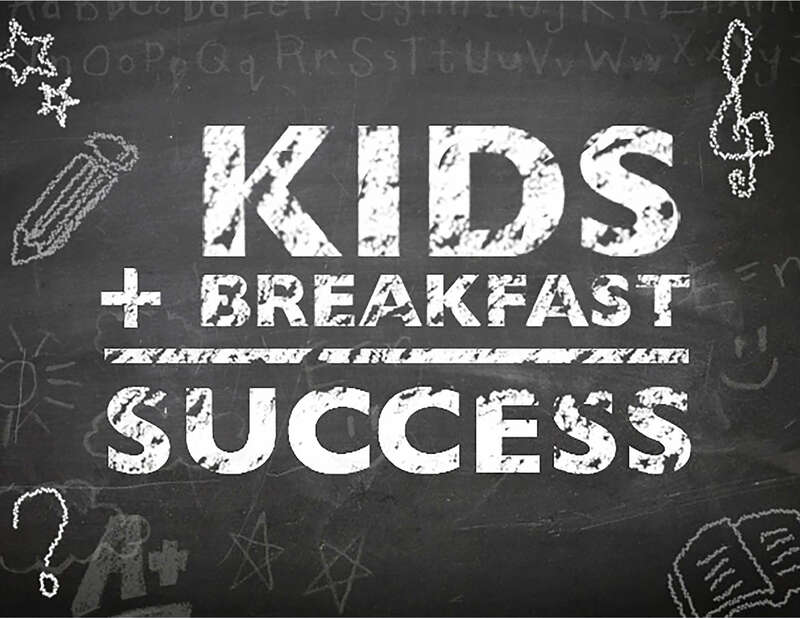 Tomorrow we will take our grand-babies shopping for those after school snacks and for good school lunches. This is important to do together. One reason is because we want to have our input in the snacks and what goes in the lunch but they also know what they will eat. Last night our teacher mentioned homework. We welcome it and will have our own little work station to do it at. We will have supplies at the ready so that homework can be done easily. A good idea is to have a place for pencils, crayons and what ever will be needed, if you have a desk then great you are ready if not a shoe box with a couple of cups does a great job as well. As far as keeping papers neat get a homework folder that can go back and forth from school and home. Its never to early to get them into reading a good book this also prepares them to do them homework when it comes time. Set aside a moment in time to have study time. Be excited if you are excited the emotion often overflows and your child will be excited as well. . Mix all together gently and pour in a spray bottle. Do no shake up this mix or you may have a lot of foam. I have also used a watering can this works well also. Spray onto urine stain and walk away. Allow to dry. No need to rub or scrub the area. For tough odors you may have to repeat. I would also check your fabric/carpet for color fastness before using due to the peroixide content. I have never had any problems with any fabric changing colors from this mix. 1. 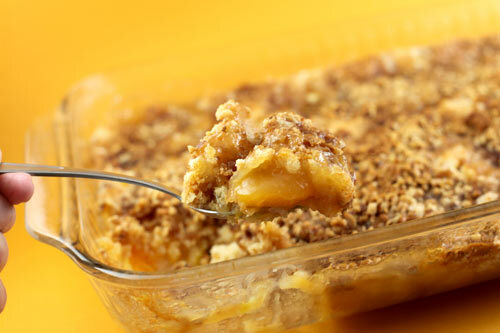 Combine the graham cracker crumbs, brown sugar and butter; press onto the bottom and up the sides of an ungreased 9-in. pie plate. Bake at 350° for 8-10 minutes or until lightly browned. Cool on a wire rack. 2. In a small saucepan, combine the sugar, flour and salt. Stir in milk until smooth. Cook and stir over medium-high heat until thickened and bubbly. Reduce heat; cook and stir 2 minutes longer. Remove from the heat. Stir a small amount of hot filling into egg yolks; return all to the pan. Bring to a gentle boil, stirring constantly; cook and stir 2 minutes longer. Remove from the heat. Gently stir in vanilla. Pour into crust. 3. In a small bowl, beat the egg whites, vanilla and cream of tartar on medium speed until soft peaks form. Gradually beat in sugar, 1 tablespoon at a time, on high until stiff peaks form. Spread over hot filling, sealing edges to crust. Sprinkle with graham cracker crumbs. 4. Bake at 350° for 15 minutes or until golden brown. Cool on a wire rack for 1 hour. Refrigerate for at least 3 hours before serving. Yield: 8 servings. Take a minute and love your feet. If you are a diabetic like I am then taking care of your feet takes on an all new importance. Taking a bit of time to love your feet can save you a future of feet problems. Andy Warhol is one of the most memorable artist in America. It was his creative artwork that has been featured in many pop culture sights and books. The colors in his art work, his setting and the stars that were in many of his pieces all made Warhol bigger than life. One of my art professors said that some of Warhol's pieces made the star rather than the star making the piece. Andy Warhol entered the world on August 6, 1928. He was one of the leading artist in pop art and his work would explore the relationship between artistic expression, celebrity culture and advertisement. It would be the life of a commercial illustrator that would bring Warhol on the scene. In his life he would create some of the most expensive art. Art in a variety of medias from drawing, painting, printmaking, photography, silk screening, sculpture, film and music would be left behind by the famous mr. Warhol. The Andy Warhol museum in Pittsburg Pennsylvania holds many of his works and is the largest museum dedicated to a single artist. Warhol even dabbled in computer generated art and creative designs. Warhol was a proud gay man who lived his life openly. His studio nicknamed the factory was a gathering place for many intellectuals, drag queens, playwrights, street people, Hollywood celebrities and wealthy patrons. I can only imagine the parties and conversations that went on there. I am sure that there are many things in your life that make you feel blessed. Now you can bring home the lesson of counting your blessings with this fun childrens book. Back to school time is here and its also time to get organized. So it would be wise to enter this giveaway for a $75 gift card to Erin Condren organizational tools. August is admit you are happy month. Yes there are many things that make me happy, my family, my job singing and working on my blog all make the list of things that make me happy. One thing you all may not know about me is that I love to thrift. Today, august 17 is national thrift store day. So add thrifting to the list of things I love to do. I would consider myself in the 39% that thrift at least one time a month. In my case it is about once a week or maybe more if I have the time. Yes, it is very cost effective I consider it a form of entertainment and love to see what all I can find. In our shopping cart you may find something for a family member (especially grand babies), something to resale or something for the house. Do you like to shop at thrift stores? What do you shop for? Does thrifting make you happy? ?